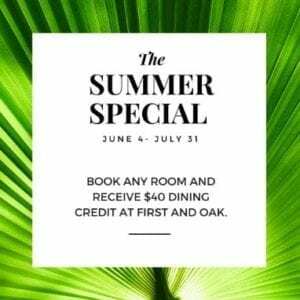 Offer Details: Book between June 4-July 31 (excluding Friday & Saturday) and receive $40 dining credit. Must book through the Mirabelle Inn (http://mirabelleinn.com/) website by selecting your booking date on the reservation bar (top left). Upon checkout, enter the promo code: SUMMER40. This offer is not valid with other discounts and promotions.